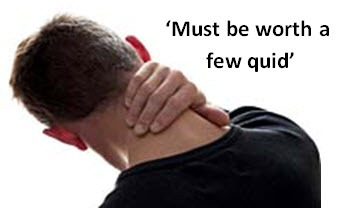 Whiplash scams – wasting doctors time – “compo” bandwagon! Whiplash fraudsters are clogging GP surgeries and wasting more than one million hours of doctors’ time every year, claims new research. Family doctors see a staggering 116,000 people every month whom they suspect are inventing or exaggerating an injury in order to claim compensation. Growing numbers of suspicious cases now also mention head, back and psychological injuries to maximise payouts. According to the study by LV=car insurance, GPs complain they have too little information to accurately judge if a patient is feigning injuries. This entry was posted in Uncategorised and tagged car insurance, fraud, fraudulent claims, GP, GP's, injury, insurance claims, whiplash by Focus on Disability. Bookmark the permalink.